Director of the HIV Molecular Research Group at University College Dublin (UCD) and Consultant in Infectious Diseases, Mater Misericordiae University Hospital. 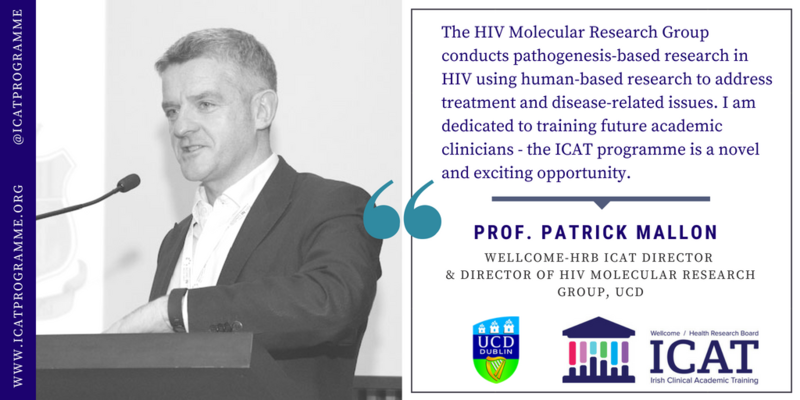 Prof. Patrick Mallon is Director of the HIV Molecular Research Group at University College Dublin (UCD) and Consultant in Infectious Diseases, Mater Misericordiae University Hospital. Prof. Mallon heads the HIV Molecular Research Group, which focuses on translational research into toxicities of antiretroviral therapy, including cardiovascular disease, adipose tissue toxicity and bone disease. Prof. Mallon is the Principal Director of the Wellcome-HRB ICAT Programme.